Historical fiction is my favorite way both to learn about history and to teach it to my children. With the book Chasing Lincoln’s Killer and some added resources, we studied the assassination of President Lincoln from the events leading up to the assassination all the way through the capture of John Wilkes Booth. While Chasing Lincoln’s Killer is technically a non-fiction book, it was written to read like fiction and is one of my favorite reads from this past year. It brings to life a crazy twelve-day period in American history. Chasing Lincoln’s Killer by James L. Swanson is is a fast-paced thriller about the pursuit and capture of John Wilkes Booth: a wild twelve-day chase through the streets of Washington, D.C., across the swamps of Maryland, and into the forests of Virginia.The book is based on rare archival material, obscure trial manuscripts, and interviews with relatives of the conspirators and the manhunters. 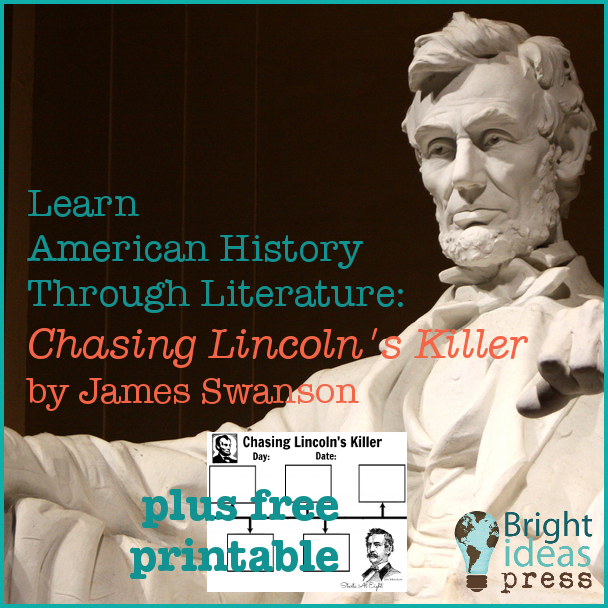 Chasing Lincoln’s Killer is the young adult (YA) version of Swanson’s bestselling book, Manhunt . Divided into fourteen chapters and an epilogue, the sentences are shorter and chapters are condensed from the original, yet this YA account of Lincoln’s assassination and the twelve-day search for his killer reads like a historical thriller. Every bit of dialogue is said to come from original sources, adding a chill to the already disturbing conspiracy that Swanson unfolds in detail as Booth persuades friends and sympathizers to join his plot and later, to give him shelter. The author gives even the well-known murder scene at Ford’s Theatre enough dramatic flourish to make the subject seem fresh. While Lincoln lies dying, Booth’s accomplices clumsily attempt to kill Secretary of State William H. Seward, and Booth talks his way past a guard meant to bar him from crossing a bridge into Maryland. In focusing on Booth, the author reveals the depth of divisions in the nation just after the war, the disorder within the government, and the challenges ahead. Abundant period photographs and documents enhance the book’s authentic feel. Why is John Wilkes Booth so angry? What happened at the home of Secretary of State William H. Seward? How was it more brutal than the plan? Why do you think only one man tried to chase Booth in the theater? How did Booth escape? What did Dr. Leale do to President Lincoln. What diagnosis did he give? Why did Dr. Leale not want Lincoln to die in the theater? Who was Edwin Stanton? Does he take his authority too far? Was his treatment of Mary Todd Lincoln cruel? Who aided the conspirators to escape? Why were Booth and Herold in no danger at the beginning of their escape? How did the news of the assassination spread? Who is Thomas Jones? How does he support Booth and Herold? Why would the army need to protect Booth if he was captured? Where would they take him? Why was Booth surprised by the reactions to the assassination in the newspapers? How had the tide of opinion changed about the President? How were the Garretts duped into helping Booth and Herold? How did they end up aiding the Union troops? How might the sequence of events been changed if John Wilkes Booth had not broken his leg? What happened to John Wilkes Booth in the end? Create a timeline of all the major events listed throughout the course of the book. The timeline should have detailed descriptions accompanying each day. Include actions in Washington and of the manhunters as well as the actions of Booth and his co-conspirators. 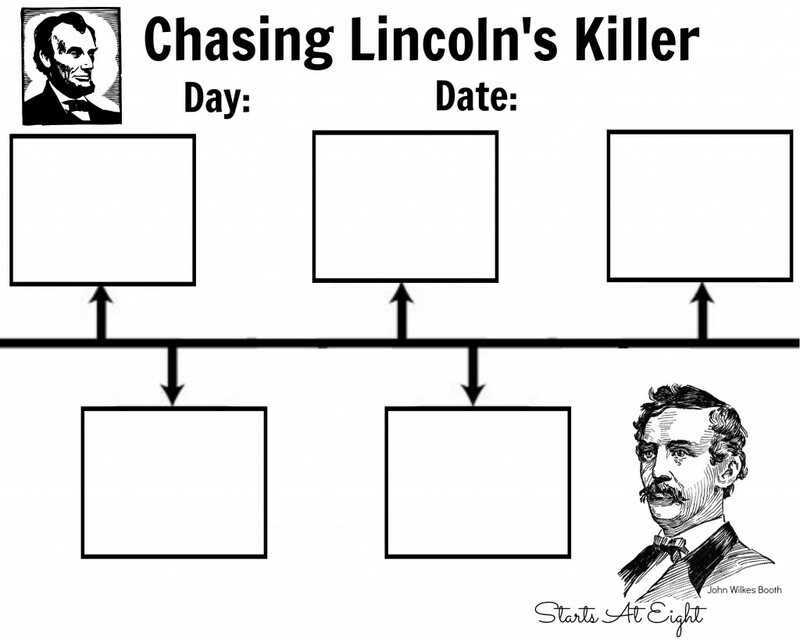 Here is a FREE printable timeline I created for use with Chasing Lincoln’s Killer. Click to access the large image. Beyond the fantastic original sources in the book, check out this Virtual Tour of Ford’s Theatre. It includes many photos and information pertaining to this historical theater as well as the events and players in the assassination of President Abraham Lincoln. Are there are parts of the book that you think may need to be screened? I realize that you can only speak from your experience, and that you don’t know my standards or the maturity level of my kids. Still, any thoughts you have would be appreciated. The subject of the book obviously already is mature (assassination and intrigue). My 3rd-grader and 5th-grader are already aware of how Lincoln died. I don’t think that they would be phased by the intensity of the story. Thanks! Dustin, because this book is the YA version, I think it is much easier to share with children. The scenes are not overly graphic in nature. While things like the bullet entering Lincoln’s head are described, it is done in a manner that is not gory, but more matter of fact. This could be read aloud to younger children which allows for you to discuss and screen as you go for your own personal needs. But if you think the nature of the book would work for your children then I think it would be worth a try.